"Yes We Can!" read a placard carried by one Tunisian protester last week, hours before he and his peers scored an improbable victory by forcing the autocratic President Zine el Abidine Ben Ali to flee the country. The demonstrator's confidence that standing up to sclerotic authority could bring political change carries a chilling message for the leaders of Egypt, Libya, Jordan, Syria and other Arab governments also ruled by decades-old autocracies. Like all of those regimes, Tunisia had long relied on its security services to terrify would-be challengers into submission, and its collapse has provided the world with an electrifying first contemporary example of a successful Arab rebellion, prompting speculation over a domino effect across the region. Even before the lightning-fast collapse of Ben Ali  although not necessarily of his regime  there had been demonstrations over rising food prices in Egypt, Jordan and Algeria. The Tunisian events were hailed by small but enthusiastic demonstrations in Egypt. And there were even reports of men setting fire to themselves in Algeria, Mauritania and Egypt in protest against their governments, mimicking the action of Mohamed Bouazizi, an unemployed Tunisian whose self-immolation last month triggered his country's uprising. Still, as much as many citizens elsewhere might seek it, a domino collapse of Arab autocracy remains unlikely. The fall of authoritarian regimes tends to come as a surprise  a miscalculation by those in power of the scale of popular outrage; of the willingness of the citizenry to defy traditional methods of control; and, most importantly, of the willingness of the security forces to kill their compatriots in defense of the regime. Tunisia, if anything, will have put the likes of Egypt, Jordan and Syria on heightened alert over the dangers posed by widespread economic grievances, making them more likely to act early to defuse such tensions. Egyptian officials over the weekend reportedly spoke of raising subsidies on food prices to ease the burden on the poor, mindful of the danger it posed. And the security forces of Egypt, Jordan and Syria are perhaps more aware than their Tunisian counterparts were that they're sitting atop a powder keg. Indeed, this week would be an opportune moment for key men in the security forces of the Arab autocracies to seek a pay raise. The key ingredient of last week's turnabout in Tunisia was the security forces, or a significant part of them, who refused to fire on their fellow citizens to protect the ruling family. Authoritarian regimes are innately vulnerable once economic despair strips citizens of their fear of challenging those in power. When soldiers are sent onto the streets to fire on people they recognize as their neighbors, their loyalty is far from certain. And it was clear that in Tunisia, the officer class was ready to seek a new governing arrangement once the cronyism of the rulers had ignited a popular revolt. That scenario ought to give Egypt's President Hosni Mubarak pause if, as is widely assumed, the 82-year-old autocrat plans to install his son Gamal as his successor  a move that would break the authoritarian regime's tradition of picking its leaders from within the senior ranks of the military. Still, Tunisia is unlikely to set off copycat insurrections, for a variety of reasons that could be grouped under the principle that each country's political situation, despite similarities, has its own unique conditions that facilitate or preclude a successful rebellion. But even before the Tunisian uprising, the omens were grim for the existing authoritarian political order in the Arab world  both for regimes closely tied to the U.S., such as Egypt and Jordan, as well as those, such as Syria and Libya, traditionally hostile. Warning that it would be premature to see Tunisia as a Berlin Wall moment for the Arab world, Beirut-based analyst Rami Khouri compares it to the uprising against Polish communism led by the Solidarity trade-union movement in 1980. While the Polish regime survived, shaken, for another nine years, the Solidarity uprising started the countdown on the final years of the Soviet satellite regimes of Eastern Europe. "As happened with an unknown electricians' union in a Gdansk shipyard in 1980 that required years more to transform an entire political universe a decade later," Khouri wrote in the Financial Times on Monday, "I suspect Tunisia's impact on the Arab world will similarly play itself out in stages ... The transformation of much of the rest of the Arab world is likely to follow in a less dramatic manner  but it will follow for sure." Many analysts have argued that the absence of an overt Islamist element in the Tunisian events have made them seem less threatening to the U.S. Perhaps, but the idea that Tunisian democracy would be free of an Islamist current is also premature; it remains to be seen what will happen when a more open system allows Islamists the political space that Ben Ali denied them. But in countries like Egypt and Jordan, deemed pivotal to U.S. security interests in the region, any popular rebellion  or genuinely democratic electoral challenge  would be led by Islamists, and the U.S. would likely play a more proactive role in seeking to ensure those regimes do what is necessary to survive. Secretary of State Hillary Clinton last week chided U.S. autocratic allies over the need for urgent reforms, warning that "in too many places, in too many ways, the region's foundations are sinking into the sand." But those leaders are banking on continued U.S. backing based on their support for U.S. national-security strategy in the region. After all, even in Iraq, where thousands of American lives and many hundreds of billions of American dollars have been invested in regime change, the resulting democratically elected government is closer to Iran than it is to Washington. What Tunisia highlights, more than anything, is the deep structural weakness of an authoritarian Arab order that has proved politically reliable in U.S. regional strategy for decades, leaving Washington caught between the democratic impulse and fear of its consequences. 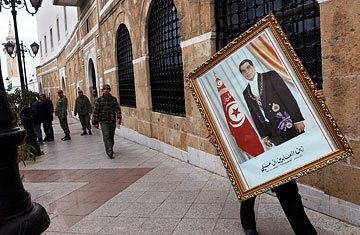 Read "Tunisia's Dictator Is Out, but What's Left Behind?"